Based in San Antonio, TX, BSG (Billing Services Group) is a BPO specializing in “payment solutions that maximize the value of the local telephone bill.” This includes offering clients third-party verification services through VoiceLog’s call recording technology via home-based call center agents. BSG works with independent contractors only in its work-at-home division; it does not hire home-based workers for traditional employment. It needs inbound agents who speak English or Spanish or are bilingual to verify sales calls made by telephone company agents. Verification agents use a script and ask a set of questions to phone company customers who are switching their service. Hours are available from 8 AM to midnight EST in shifts of 2, 3, 4, 5 or 6 hours at a time. Pay is $8.50 an hour for these non-sales, phone jobs. Training is required but not paid; however, there are no fees to agents associated with the training (which can occasionally be the case for independent contractors). The training is done via long-distance telephone, but long-distance service is not required once training is finished. You must be a U.S. citizen, with a Social Security number, residing inside the United States. You must be at least 18 years old and be able to pass a background check. 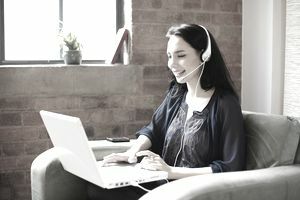 One year of customer service experience at a call center is preferred, and agents should be reliable patient and friendly and have an even tone of voice in all situations. Not in the United States? Find a Call Center Job in Canada or a job at one of these Global Work-at-Home Jobs. Agents need a quiet home office with a computer running Windows Vista or 7 or MAC OS X, 2 GB of RAM, 4 1.6 GHz CPU (processor) or higher, Microsoft Word and Excel, Internet Explorer 8.0 or higher. They also must have either cable or DSL high-speed Internet, a printer, e-mail address at a provider that allows large attachments, AOL Instant Messenger account. A second landline phone must already be installed in your home. It will have to be dedicated to accepting inbound calls and have no calling features (call waiting, voicemail etc.). The requirements are fairly typical of most home call center companies. See more of the typical office requirements for home call centers. Submit your application via the BSG website. Applicants are contacted when there are openings. Qualified candidates applications will be held for six months.